Schannae Lucas, an associate professor of criminology and criminal justice, and the Cal Lutheran students travel to Todd Road Jail each week for the classes. (SANTA PAULA, Calif. – Feb. 2, 2018) A California Lutheran University professor is teaching the first college class inside a Ventura County jail for both incarcerated and traditional students. Schannae Lucas, an associate professor of criminology and criminal justice, worked for more than two years to bring the Inside-Out Prison Exchange Program to Todd Road Jail near Santa Paula with funding from various university departments. Cal Lutheran is one of only five California colleges participating in Inside-Out. Although vocational and high school courses are available to Ventura County inmates, this is the first college class and the only program where inmates learn alongside traditional students. It is also one of very few Inside-Out programs that provides incarcerated students with college credit. Most of the incarcerated students are taking the class for credit. The 18 students from Cal Lutheran and the jail are taking Examining Social, Crime and Justice Issues. They began weekly evening classes together inside the jail on Jan. 23. Outside of class, they are reading texts and writing papers. In class, they sit in a circle in either large or small groups to discuss issues such as crime and justice, victimization, the criminal justice system, restorative justice and mass incarceration. They will spend the last month working together on final projects. The last joint class on May 1 will feature group presentations and a closing ceremony attended by representatives of the university, jail and community. 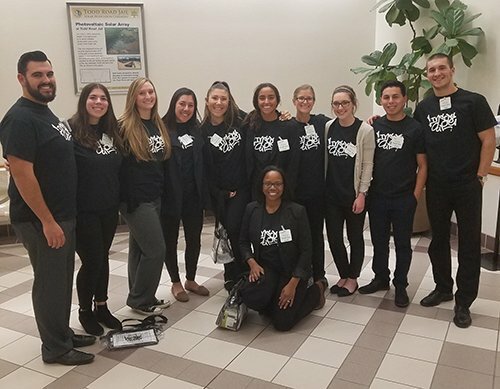 For the Cal Lutheran students, who are all majoring in criminal justice, the course also provides an opportunity to learn firsthand about the issues they have been studying. Some are double-majoring in psychology or sociology. More than 30,000 “inside” and “outside” students have taken classes in a variety of subjects, not just criminal justice, through the international program. Lucas is working to add classes taught by faculty in a range of disciplines to the Ventura County program. All of the Ventura County students had to complete applications and interviews before they were selected. They need to follow rules such as leaving cell phones and laptops behind and not sharing last names or personal information with one another.